One of JAMS most respected neutrals, Hon. George Bundy Smith (Ret.) passed away on August 5, 2017. 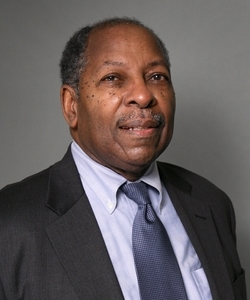 He joined JAMS in 2011 after serving for more than 30 years in the New York State Court System. For the last 14 of those years, he was a New York State Court of Appeals judge, the state’s highest court. His entire life was committed to the pursuit of justice, seeking to assure fairness, inclusiveness and equal opportunity. While a law student at Yale, William Sloane Coffin, Yale University’s chaplain and a man active in the Civil Rights Movement, invited him to travel to Montgomery, Alabama as a Freedom Rider. Judge Smith accepted, even though it was just two weeks before he was scheduled to take his law school exams. He and his fellow riders were then arrested for sitting at a whites-only lunch counter. He missed his exams and was convicted of breach of the peace, but the U.S. Supreme Court later reversed the conviction. Throughout his distinguished life and career, Judge Smith received numerous awards and honors, including life-time achievement awards from the Judicial Friends, an organization of predominantly African American Judges in New York State; the Nigerian Lawyers Association; the Fund for Modern Courts; the Golda Meir Award from the Jewish Lawyers Association; and honorary doctor of laws degrees from Albany Law School, Brooklyn Law School and Fordham Law School. He is survived by his wife, Dr. Alene L. Smith, son George Bundy Smith, Jr., daughter Beth Beatrice Smith, two grandchildren, as well as his sister Inez Smith Reid and brother, Dr. Sidney R. Smith, Jr.
Funeral services will be Saturday, Aug. 12 at Riverside Church in Manhattan. The viewing is from 9 a.m. to 10 a.m. and services will begin at 10. In lieu of flowers, donations in the memory of Judge Bundy Smith may be made to Phillips Academy Andover.